Dr McClaran is the Head of Surgery at London Veterinary Specialists. She is an ACVS Specialist Surgeon, specialising in soft-tissue surgery. 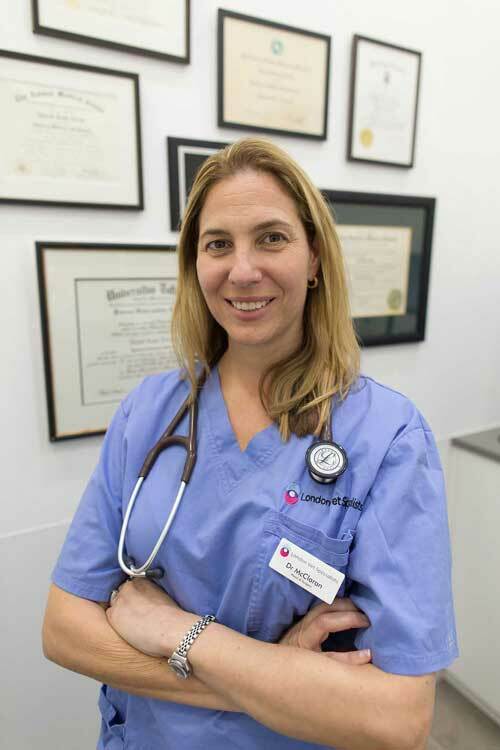 Most recently, she was head of the Department of Surgery at the Animal Medical Center (AMC) in New York, one of the largest and busiest veterinary hospitals in the world. Dr McClaran received her Doctorate of Veterinary Medicine from Tufts University, Massachusetts, USA in 1998. She then completed her internship and residency at the Animal Medical Center, staying on as a surgeon and residency director. She is an ACVS Specialist Surgeon, specialising in soft-tissue surgery. Her time at the AMC provided Dr McClaran with in-depth experience across the entire range of soft tissue surgical procedures. In addition she has particular clinical and research interest in minimally-invasive and oncological (cancer) surgery. As well as being an active member of the Veterinary Endoscopy Society and the Veterinary Soft Tissue Society, Dr McClaran serves on the ACVS Foundation Board, is an Advisor of the Cummings School of Veterinary Medicine and member of the Veterinary Society of Surgical Oncology. She speaks nationally and internationally on minimally-invasive surgery at conferences and academic meetings, as well as publishing widely on the subject in journals and textbooks. Knight R, Mcclaran JK. Hemoperitoneum secondary to liver lobe torsion in a cat. Accepted for publication JAHAA April 2018. McClaran JK, Skerett S, Currao RL, Pavia PP, Tarvin KT. Comparison of Laparoscopic-Assisted Technique and Open Laparotomy for Gastrointestinal Biopsy in Cats. Vet Surg 2017; 46: 821-828. Petre SL, McClaran JK, Bergman PJ, Monette S. Safety and efficacy of laparoscopic hepatic biopsy in dogs: 80 cases (2004-2009). J Am Vet Med Assoc. 2012 Jan 15;240(2):181-5. Spector DI, Fischetti AJ, Kovak-McClaran JR. Computed tomographic characteristics of intrapelvic masses in dogs. Vet Radiol Ultrasound. 2011 Jan-Feb;52(1):71-4. Buote NJ, Kovak-McClaran JR, Schold JD. Conversion from diagnostic laparoscopy to laparotomy: risk factors and occurrence. Vet Surg. 2011 Jan;40(1). Eisele J, McClaran JK, Runge JJ, Holt DE, Culp WT, Liu S, Long F, Bergman PJ. Evaluation of risk factors for morbidity and mortality after pylorectomy and gastroduodenostomy in dogs. Vet Surg. 2010 Feb;39(2):261-7. McClaran JK, Buote NJ. Complications and need for conversion to laparotomy in small animals. Vet Clin North Anim Pract. 2009 Sep; 39(5): 941-951. Fischetti A and Kovak JR. Azygous Continuation of the Caudal Vena Cava with and without Portocaval Shunting. Journal Vet Rad and Ultrasound. 2008; 9(6): 573-576. Cavanaugh RP, Kovak JR, Barton LJ, Bergman PJ. Evaluation of surgically placed gastrojejunostomy tubes in critically ill dogs. J Am Vet Med Assoc. 2008 Feb 1; 232(3): 380-388. Schwartz P, Kovak JR, Bergman PJ, Peterson M, Ludwig LL. Evaluation of prognostic factors in the surgical treatment of adrenal gland tumors in dogs: 41 cases (1999-2005). J Am Vet Med Assoc. 2008 Jan 1; 232(1): 77-84. Buote N, Kovak JR, Fischetti A, Monnette. Meckels diverticulum in a dog –what’s your diagnosis. J Am Vet Med Assoc. 2007 Aug 15; 231(4): 527-528. Kovak JR, Ludwig LL, Bergman PJ, Baer KE, Noone KE. Use of thoracoscopy to determine the etiology of pleural effusion in dogs and cats: 18 cases (1998-2001) JAmVet Med Assoc. 2002 221(7): 990-994. Buote NJ and McClaran JK Laparoscopic Contraindications, Complications and Conversion In: Small Animal Laparoscopy and Thoracoscopy, Boel Fransson and Philipp Mayhew Eds. Hoboken, NJ. Wiley-Blackwell 2015. McClaran JK and Buriko K Intussception In: Small Animal Surgical Emergencies. Aronson, L, Ed. Hoboken, NJ. Wiley-Blackwell 2015. Kovak JR. Foreign body, linear gastrointestinal. In: Cote, ed. : Clinical Veterinary Advisor: Dogs and Cats (3rd ed) Louis, Mo: Mosby; 2014:pp 407-9. Kovak JR. Gastrointestinal obstruction: foreign body or neoplasia. In: Cote, ed. : Clinical Veterinary Advisor: Dogs and Cats (3rd ed) Louis, Mo: Mosby; 2014: pp 445-6. Kovak JR: Rectoanal stricture. In Cote, ed. : Clinical Veterinary Advisor: Dogs and Cats (3rd ed) Louis, Mo: Mosby; 2014:pp 965-6.